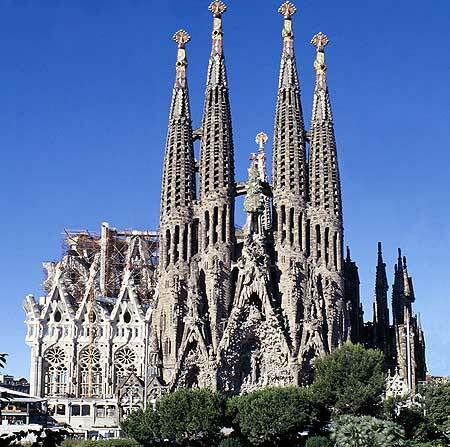 Spain is one of the countries with many interesting tourist attractions. Spain is popularly known as the "Sun Drenched and Wild Land". The country has a lot of stunning tourist attractions and performances, "Toreros' (Bull Fighter and 'flamenco bailaors' (dancer). Also the popular one is paella and' pitcher of sangria ', it is also the amazing place. The country is also known for beauty and splendor. You can enjoy many famous tourist attractions in Spain through visiting the Alhambra in Granada, Seeing the amazing architecture of Frank Gehry, skiing in the Sierra Nevada mountains, spectacular view in Ronda, visiting Barcelona, enjoy Spain Arts and much more. 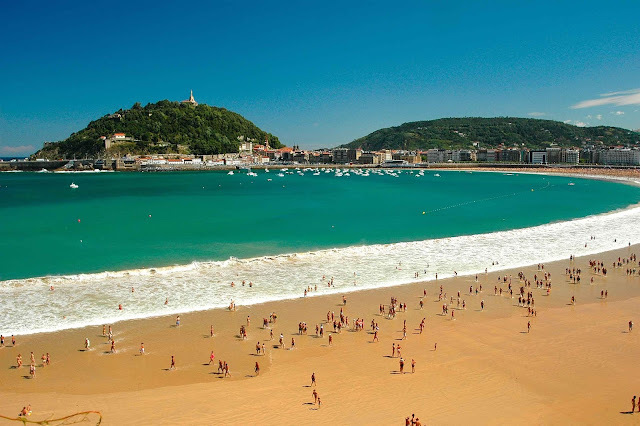 La Concha at San Sebastian is one of the best beaches in Europe, especially in Spain. You can surf on the beach, walk along the promenade to find a good restaurant and enjoy the beautiful scenery. La Concha is surrounded by steep cliffs and islands. Here visitors can surf, take a walk on the beach and enjoy the atmosphere of typical Spanish green trees. La Concha is one of the tourist attractions in Spain. If you have the opportunity to take a trip to Spain it would not be completed if you do not stop at La Concha. At La Concha you can see some spectacular places that could be seen across the bay towards the small island, between the tree-lined of Santa Clara. There is Soft sand, beautiful and clean scenery as well as the Atlantic waters that is clearly visible from the beach. But La Concha is long and wide enough for you to find a quiet and calm place, even in peak tourist season. La Concha will be as much as you expect from a town beach, with excellent facilities, plenty of locker room and sunbeds. With a combination of cultural and natural beauty, La Concha is one of the best beaches that you would get in a city and also in Europe. Sagrada Familia is a large Roman Catholic Church in Barcelona; It is one of the tourist attractions in Spain which is mostly visited in Spain. The Church was designed by Antoni Gaudi, the Catalan architect who worked on this project for nearly 40 years until his death in 1926. The Church is incredibly worth a visit. You can visit the basement where Antoni Gaudí is buried in the middle of the nave and transept-like giant, tree-like pillars and spectacular dome. A museum tells the history of the church and the story of a famous architect. You can also visit the tower, the elevator, and take a walk which will bring you to the top of the tower where you can get a lovely view over the city of Barcelona. Real Palacio is one of the famous places to visit in Spain, Real Palacio (Royal Palace) Madrid is the official residence of the king of Spain, although it is only used for state ceremonies. Royal Palace was built between the years of 1738-1755 by King Carlos III, and he settled in the palace in 1764. 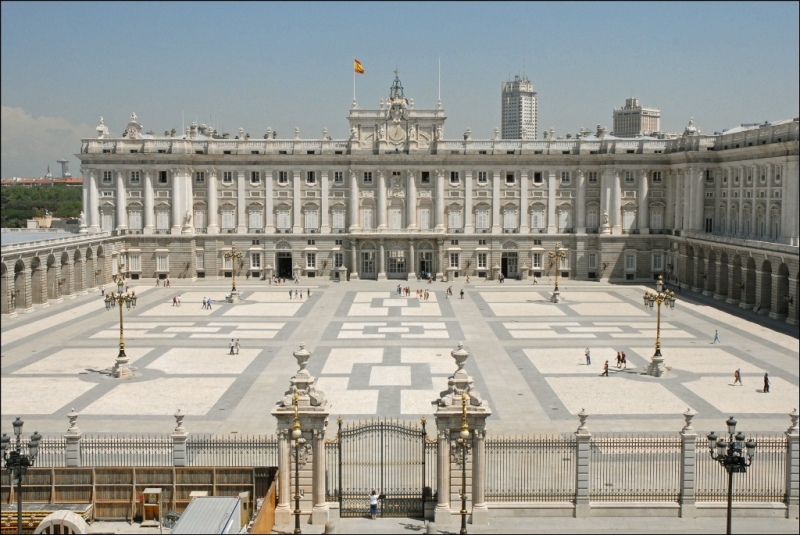 Madrid Royal Palace is considered one of the best palaces in Europe. Real Palacio is the largest palace in Europe which has a floor-palace area of 135,000 square meters (1,450,000 sq ft) of floor space and has 3418 rooms. Interior design of the palace is important for preserving the Spanish art, in terms of the use of all types of fine materials in the construction and decoration of the rooms with works of all kinds of art, such as paintings made by Caravaggio, Velázquez and Francisco de Goya and frescoes by Corrado Giaquinto, Giovanni Battista Tiepolo and Anton Raphael Mengs. Other collections were stored in the building are the Armoury, Porcelain, Clocks, Furniture and silver. So it is fair if you say that Real Palacio is the largest palace in Europe. The palace was built in the 14th century by the sultan Banu. Al Hambra is a complex of palaces, royal relics of the golden age of Andalusia which is located on a hill at the edge of the province of Granada region of Andalusia, southern Spain. 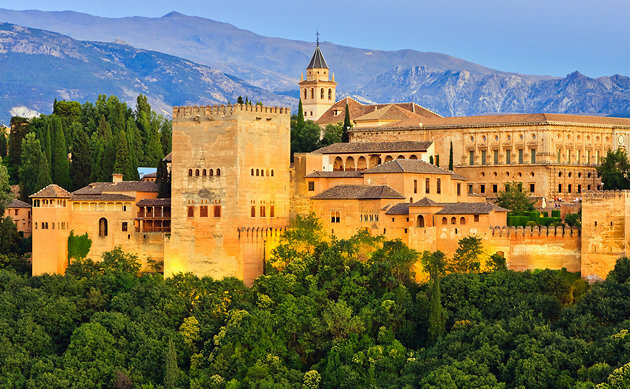 Alhambra is also one of the top cultural footage ever achieved by Europe. Al Hambra palace complex was about 1300 years old, and had been a settlement by as much as forty thousand people, complete with housing, schools, parks and gardens. Al Hambra palace is now become one of the interesting Places in Spain and has a lot of visitors who come just to see Alhambra palace. 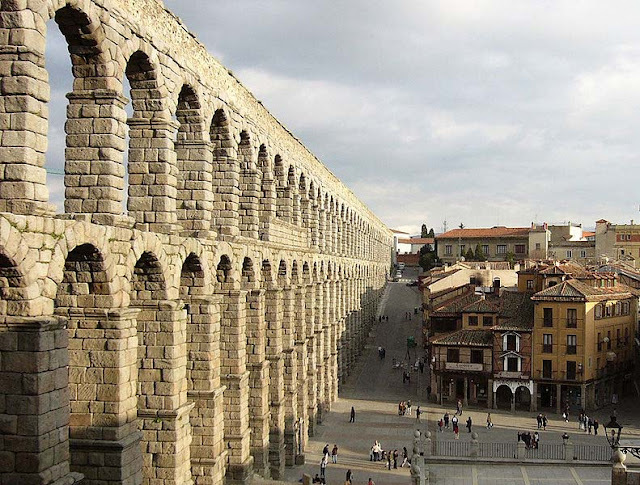 This ancient aqueduct is bringing water along 16 km (10 miles) from the Frio River to Segovia and was built from 24,000 large granite blocks without using mortar. This aqueduct was built around 50 AD, and still provides water for the city in the 20th century. Segovia aqueduct has now become one of the famous places to visit in Spain. The water channel is located in the Iberian Peninsula and is part of the UNESCO World Heritage Site. The drains are a major architectural landmark in the city. It continues to function until now, in good condition and well maintained. 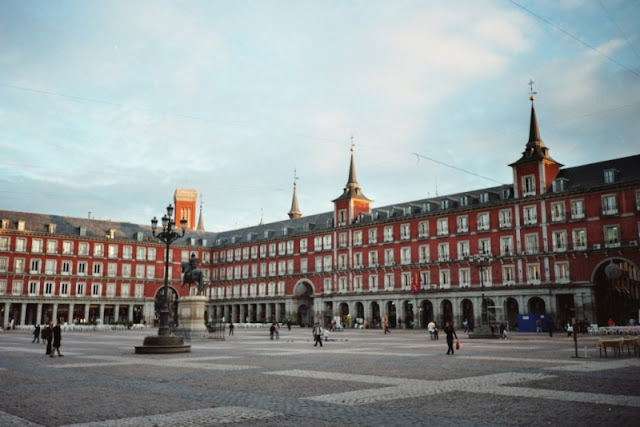 This place is a rectangular town square and is located in the center of Madrid, Spain. The town square is one of famous main squares in Spain and is very popular among tourists and local residents. Mostly the building in the Plaza Mayor has a similar architecture and consists of 4 levels. The first stair is occupied by cafes and shops, while the rest of them are residential buildings, apartments, and hotels. From the old time, the Plaza Mayor has become the center of the crowd and the convening of various events. Currently, the Christmas Market and also the celebration of San Idiro Festival are also held here. Plaza Mayor is also often a starting point and gathering place for tourists before venturing city of Madrid. In addition to walk around and sit down, the Plaza Mayor visitors can also relax in the many cafe terraces and outdoor cafe that is on the edge. 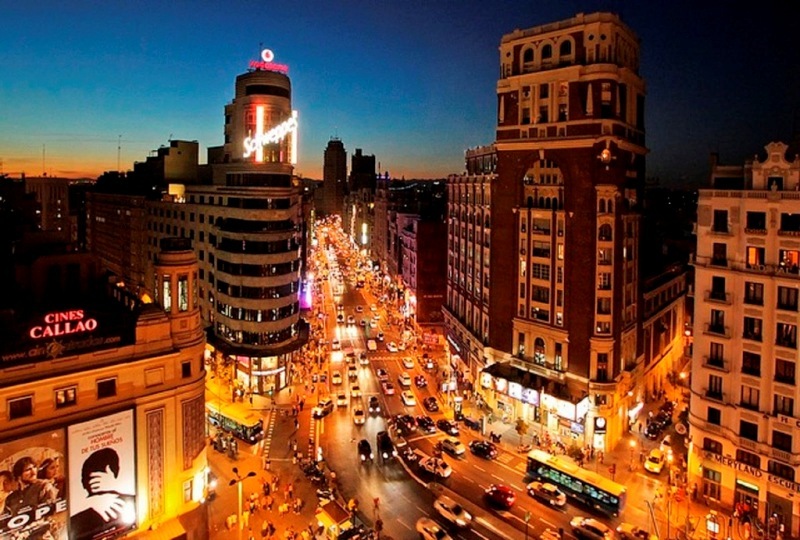 Grand Via is located in the city of Madrid. This street is fairly well-known as a shopping center and the most importantly the entertainment center. It was supported by the existence of many stores and shopping center, theater, cinema, and hotel lined along the street. Besides its shopping center which attracts many visitors and tourists, there is another interesting and special thing from the Gran Via, which is high-rise and beautiful buildings from the 20th century stand along this road, such as Edificio Espana, Edifio Grassy, and Torre de Madrid. 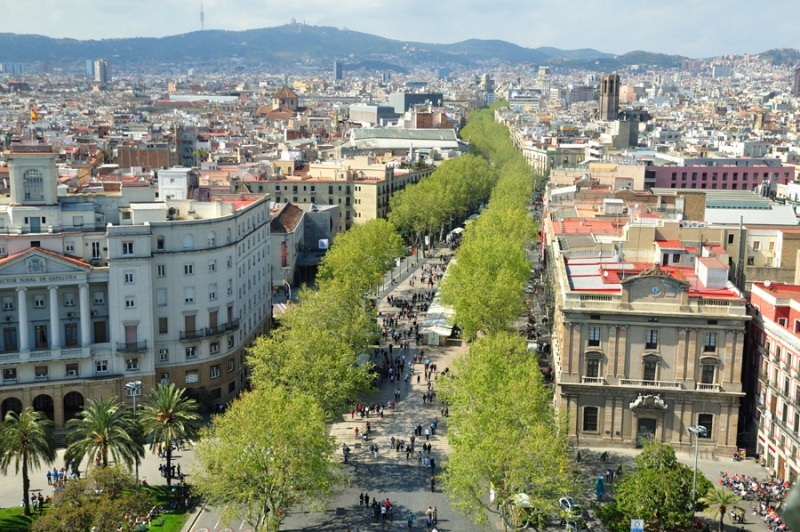 La Rambla is a 1.3 kilometer long road that stretches from the Plaza Catalunya town square up to the old port of Barcelona, Port Vell. Both locals and tourists happily down the road as it is called as the most famous road in Barcelona. At the end of the street closest to Plaza Catalunya there is a fountain. According to legend, anyone who drinks from this fountain will keep returning to Barcelona. So no wonder if many tourists try it. La Rambla is famously known convenient for pedestrians. This road is pretty wide and the center part is specifically for pedestrians. Both on the right and the left sides are for car and motorcycle lanes. There are many old buildings along the edges of the path for cars and motorcycles. The lower part of the building was used for shops, restaurants, until the currency exchange point. Although comfortable, we must remain vigilant when walking in the region. Understandably, like most cities, Barcelona also not free from the pickpocket. 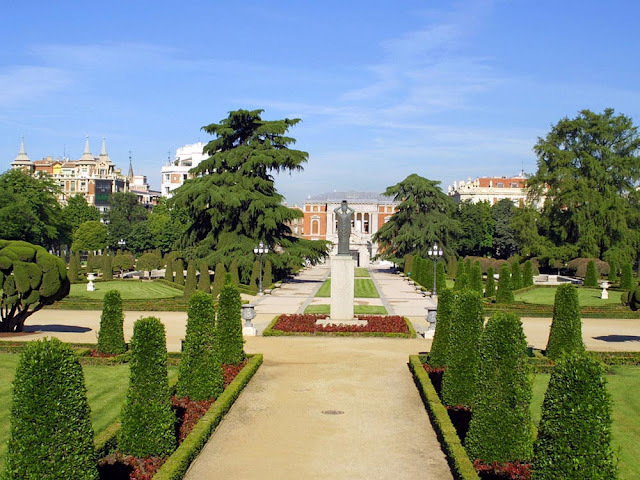 This place is a beautiful garden and the most extensive in Madrid. The park is located at the heart of the city and become one of the famous tourist spots in this place. On weekends, Retiro can be very crowded by foreign visitors and local residents and families to spend a weekend recreation. There are many features and interesting spots to be enjoyed in this park. Besides the interesting place, El Retiro Park is also famous for its various events and exciting outdoor activities, and also there are a lot of artists and street performers ready to entertain visitors. The Retiro also has a very famous unique tree that became an icon of this park. Spain has a nickname Matador country because it has famous tradition throughout the world, namely bullfighting. One of the famous venues is Las Ventas. The arena was built in 1923 and it can accommodate up to 23.798 spectators. In addition to watch the show, you can also see historical objects relating to bullfighting, ranging from painting, sculpture, and also the equipments of bullfighting as well as matador outfit. 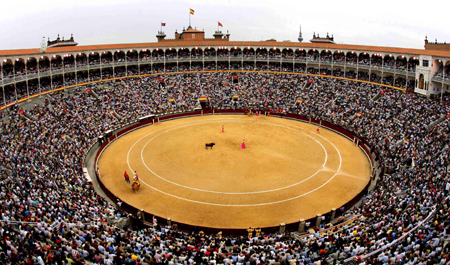 Las Ventas has become one of the famous places to visit in Spain by many years and probably with many years to come.